I was walking home one night at dusk, when I saw this bike parked in my neighborhood. The nearby streetlamps cast eerie shadows on the sidewalk in front of me. I snapped a picture of it for posterity’s sake. Upon arriving home, I uploaded the image to my computer and adjusted the color saturation, etc., resulting in the following image. At some point, I printed the photo onto glossy photo paper. 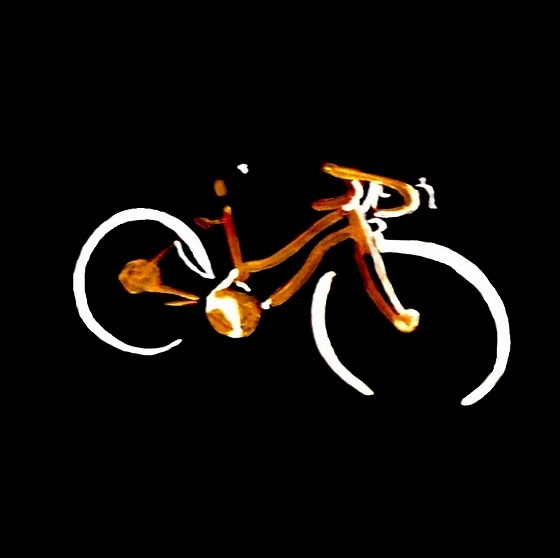 Using acrylic paint, I accentuated the area surrounding the bike’s shadow. 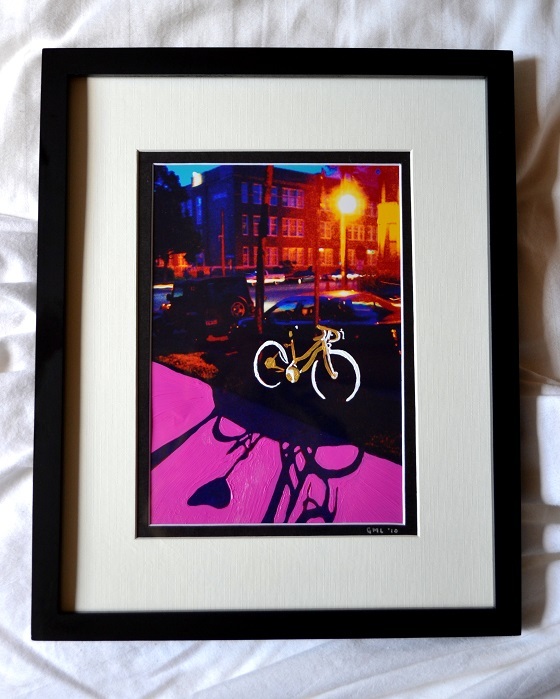 Eventually, I framed the finish product. 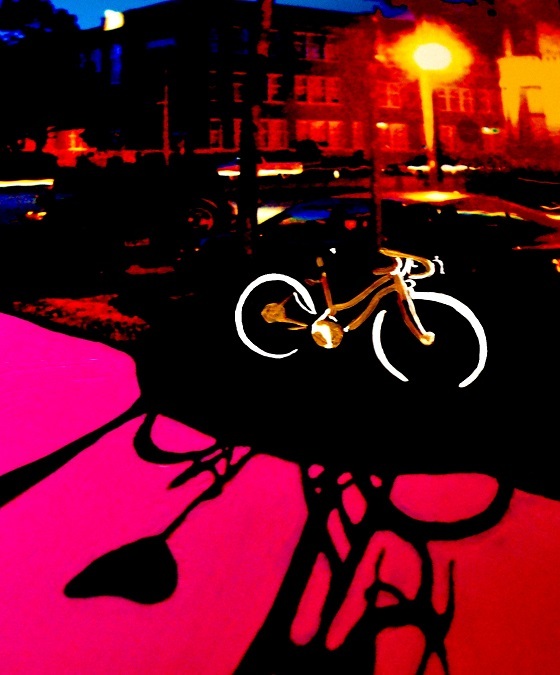 It was displayed at Altered Esthetics Gallery in Minneapolis for their Bike Art VII Show. Even after having sent the artwork to the group show, the image still stuck with me. It felt unfinished somehow, so I made further adjustments to the JPEG file above using Picasa and the end result was as follows. As a final step, I cropped the image and touched it up using Microsoft Paint. Voila! We have come full circle. Very cool Gina. Was this by the last apt. you lived at in Mpls? Thanks, Ilona. 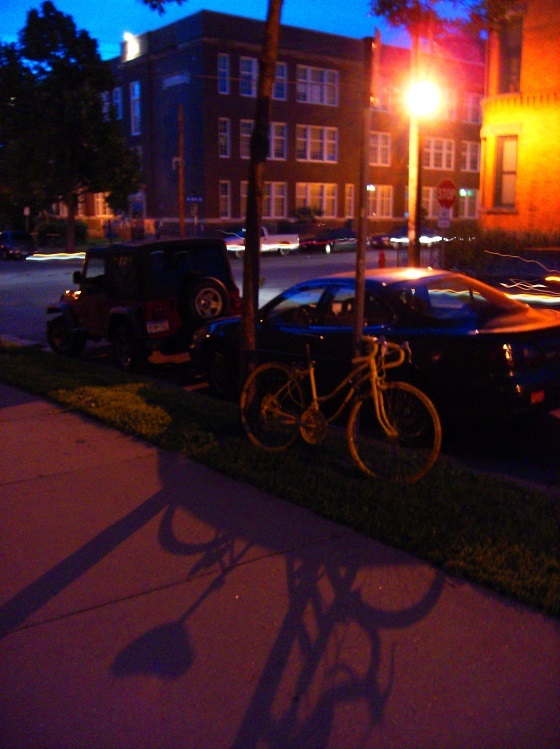 Indeed, this photo was taken in the Loring Park neighborhood, two blocks from my last apartment.